Ancient Tomb , Dimir Aqueduct , Darkwater Catacombs , Sunken Ruins , for some land upgrades. Drop Exotic Orchard , You're in 2 color, it's not that good. Please use double square brackets to link cards so it's easier to answer the question. It doesn't matter if Sulfur Falls is tapped or not. 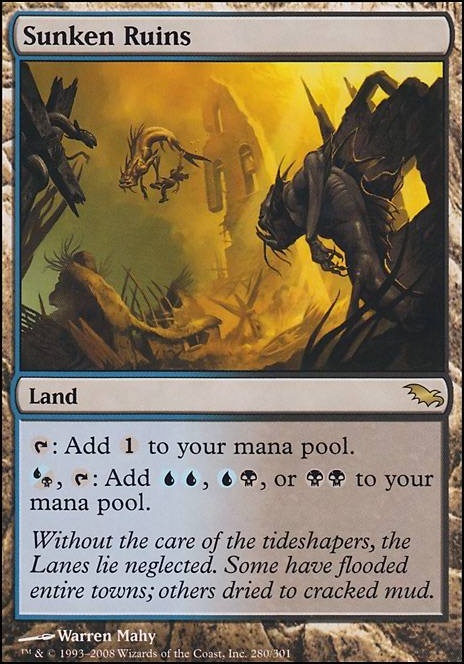 As long as it's a land you control, Reflecting Pool will be able to tap for or because those are two types Sulfur Falls could produce. Reflecting Pool checks whether a land could produce a type of mana, but it doesn't check the cost to do so. So if Sunken Ruins is your only other land, Reflecting Pool can still tap for , , or because those are the types Sunken Ruins could produce. 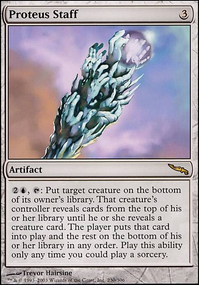 Again, because Shadowblood Ridge is capable of producing and , Reflecting Pool is also capable of doing so. Again, Reflecting Pool doesn't care if the land in question is tapped. It only cares what types of mana it could produce. So if you have a basic Plains and Reflecting Pool , but your Plains is tapped, Reflecting Pool can still produce . Please link all cards in your question using double square brackets. Reflecting Pool checks the effects of all mana-producing abilities of lands you control, but it doesn’t check their costs. For example, Vivid Crag says “, Remove a charge counter from Vivid Crag : Add one mana of any color.” If you control Vivid Crag and Reflecting Pool , you can tap Reflecting Pool for any color of mana. It doesn’t matter whether Vivid Crag has a charge counter on it, and it doesn’t matter whether it’s untapped. I think this answers most of your questions since the other lands being tapped doesn't matter to what mana Reflecting Pool could make, and being able to pay other costs (such as on Sunken Ruins or on Shadowblood Ridge ) also doesn't matter. Looks good, but then again I wasn't expecting any less of you. Radical Idea & Think Twice - these would be solid in a budget storm deck. But unless I'm missing something big, aren't there cantrips that would go better with your overall gameplan? Coldsteel Heart - it's not a bad card, it's probably the best tapped rock. But in 2c, without a rock hoser that demands a critical mass of rocks (PE or Isochron), without obvious color-hungry plays on t4, idk if you need this one. Also it's 2 life with AdNaus, which is worse than 1 or 0. Whispering Madness - is there an obvious use other than wheeling I'm missing? Bc 4 mana for a second copy of Windfall seems meh. Trinket Mage , Dimir Infiltrator , Trophy Mage - these seem quite narrow in here. 3 mana for such limited tutors at sorcerly speed seems like much of a drawback. 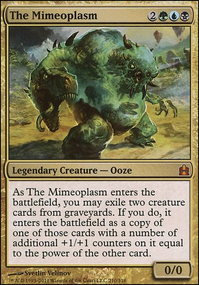 Predict & Thought Scour - these are nice anti-topdeck tutor techs that open up some interesting doomsday piles. 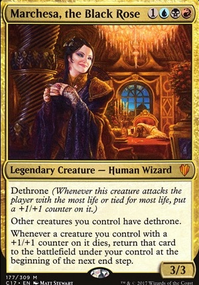 Talisman of Dominance - an obvious inclusion in UB if you ask me. It's your deck though. So ultimately you know what works or what doesn't work in here better than I do. Cut the rune snags for a combination of Darkslick Shores and Sunken Ruins , once that is done replace the underground rivers with Mutavault and try to find room for a 23rd land. I highly recommend replacing thieve's fortune with Chart a Course . There's really no reason for you to be running dismember instead of Fatal Push . Your sideboard defibitely needs work, but definitely depends on your meta. I strongly graveyard interaction like Nihil Spellbomb or Faerie Macabre . Unmoored Ego is fun against from and combo decks. Cast Down or go for the throat. Collective Brutality is an amazing card that will help you out in a tom of different match ups. If you start to face artifact based decks, Hurkyl's Recall may be your best bet. Also try to get four of those bitterblossom! Maybe you could consider Gamble and/or Entomb since you don't really care about binning your cards. You also need some of that Urborg, Tomb of Yawgmoth to help meet the black cost of Doomsday. The filter cycle could also help Sunken Ruins and Graven Cairns. Other spells that may interest you are Breaking / Entering I know you don't run much in the way of creatures, but this can hit any graveyard, and it can get you back your win con if it dies somehow. Dig Through Time because Dig Through Time, enough said. Fact or Fiction and of course its lesser Steam Augury. Maybe an odd suggestion, but I have seen a lot of jund-ey sultai decks run Gifts Ungiven. This lets you stock the yard, which helps all of your creatures, as well as making all of your 1-of good stuff cards like extraction and spellbomb do a lot more. Also, the fact that it’s an instant means you usually don’t waste a turn playing it; you do it on your opponents end step. Other than that, you definitely need some counter spells but I’m not sure if Negate is the way to go. 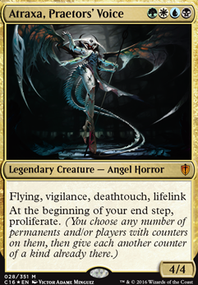 Remand might be good because of the card advantage and the mainboard Lilliana of the veils to strip the card you countered. Dreadnought in your graveyard is a 12/12 with trample for one mana with Lazav. Dreadnought and Asp in your graveyard is a combo. Become Dreadnought with Lazav attack and in combat become Asp, make Asp have infect for and kill an opponent with trampling 12/12 infect. Soulgorger is a 8/8 for three mana, also good. Buried/Windfall/Frantic/Careful are all potential early game plays to get creatures into your graveyard. Windfall/Frantic/Careful can also draw which is helpful. 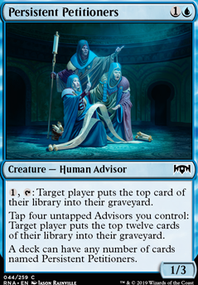 Buried is pretty important because it can tutor for and put up to three creatures into your graveyard at one time for three mana. It alone can set up the Dreadnought/Asp combo. Jace/Wharf/Looter can be early game creatures who can be repeatable ways to draw while also putting a creature into your graveyard.